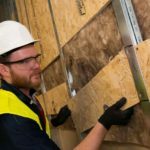 To make the use of plasterboard partitions more straightforward MEDITE SMARTPLY has introduced a new OSB3 panel, PATTRESS PLUS. Suited to buildings featuring plasterboard partitions, the panels have a continuous recess along one side that is designed to accommodate ‘C’ studs without the need to cut in slots on site. This design feature means that each panel sits flush against the stud flange, holding steady while you screw the other side into place. The product will be available to order from 1st February 2019 and are available in thicknesses of 15mm or 18mm, widths of 397mm or 597mm (to fit 400mm and 600mm stud centres), and lengths of 1250mm or 2397mm, in line with leading plasterboard partition specifications.